We have arrived at the eve of the Armenian Revolutionary Federation–Dashnaksutyun World Congress, when the 128 year old political organisation’s global branches will send delegates to Armenia for a thorough review of the past four years of activity, as well as to pave a path forward for its next four years. And in order to properly gravel this forward road, it is critical that the ARF points the mirror directly at itself during this review. It is important that the organisation judges how its own decision-making, packaging and messaging has impacted the ARF’s ability to lead the nation of people that created it out of necessity and hope in 1890. This would mean that the ARF resists any and all temptations to convert what is the organisation’s primary opportunity for self-reflection, to instead reflect on the activities of Armenia’s now-Acting Prime Minister, Nikol Pashinyan. Pashinyan has understandably dominated Armenia’s political landscape since he led the country to long-awaited regime change – armed by popular support from the people – in what has been labelled the Velvet Revolution. In the ensuing election, the ARF was not able to pass the requisite threshold of 5% to serve in Armenia’s parliament, scoring only 3.9% of the public’s support in an election that was won in a landslide by Pashinyan’s My Step Alliance. The fallout from this result has been mostly sub-standard political commentary of all the other players – including the ARF – where their decisions, packaging and messaging has been critiqued from only a single angle: Pashinyan. For example, leaders of parties that oppose Pashinyan have consistently ignored their own shortcomings by shining a light on what Pashinyan did, what Pashinyan did not do, what Pashinyan said, what Pashinyan did not say and what Pashinyan will do and what Pashinyan will not do. “History will judge us to be correct,” they have said while ignoring the reality that election campaigns are competitions for the present; in this case a competition for the hearts and minds of Armenians today. While valid commentary might be spun into such nothingness with effective use of the media, a political force with a history of service such as the ARF owes its World Congress the respect to stand tall above all of this and honestly reflect on itself. Yes, this means resisting the temptation to turn this review into a referendum on Pashinyan, and resist focusing on the revolution’s resulting euphoria as the primary reason for any ARF failures, among a myriad of other reasons beyond the party’s immediate control. This also means acknowledging that the ARF has plenty to discuss. 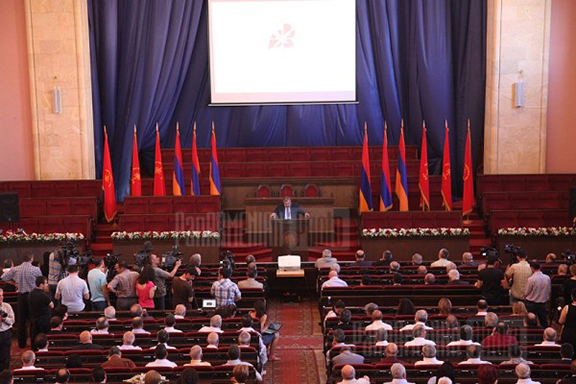 Its activities in over 20 countries around the world will undoubtedly feature, as will its activities in Artsakh and Javakhk, however the focus of any honest review of the period between 2015 and 2018 must be the ARF’s activities in mainland Armenia, which culminated in the public rejecting the opportunity to re-elect the party into its National Assembly. You see, history proves that the ARF has been dutifully building political capital in the Armenian world for over a century. The blood it spilled to achieve an improbable independence in 1918; the exemplary leadership of the First Armenian Republic under desolate conditions through to 1921; the establishment and maintenance of the Diaspora as the torchbearers for a future Republic during Armenia’s Soviet occupation; the heroism on the battlefields of Karabakh ahead of the Republic of Artsakh’s successful vote for self-determination; the legislative victories recognising the Armenian Genocide across most continents – these are all but examples of the capital that has been naturally built out of sincere obligation over 128 years. It hasn’t all been doom and gloom during the past four years either. Deposits have been made towards this capital. The ARF’s leadership to achieve the Constitutional Reforms that brought Armenia to a parliamentary system of governance, replacing the old presidential model; the instinctive reaction of the ARF world to respond with frontline volunteers, resources and advocacy during the four-day Artsakh War in April 2016; the vision to achieve a united call for justice for the Armenian Genocide during the Centenary year of 2015; the activities to support the homeland, Artsakh and Syrian-Armenians by outstretching the global tentacles of the ARF – these are among examples of continued capital building. So how does such political capital get spent, to the extent that an organisation with the aforementioned track record cannot even attract 5% support from its fellow citizens? This is the key question that needs to be honestly, selflessly and courageously pondered by the ARF World Congress when it convenes in January 2019. Sure, the euphoric environment played a role. Sure, Pashinyan played a role. Sure, foreign interests might be flexing their muscles in Yerevan like they are known to do in countries with the geopolitical realities of an Armenia. Notwithstanding these points, my hope is that the ARF focuses on what it itself is directly able to control, which is none of the aforementioned. For example, the ARF has been criticised for its delay in joining the revolution. Moreso, the ARF has been criticised for standing with its Coalition partner, the Republican Party of Armenia (RPA) and their nominee for Prime Minister – former President Serzh Sargsyan – while protests against Sargsyan’s perceived grab for a third term in power grew on the streets of Yerevan. The ARF has also been criticised for its controversial exit from the unity government formed by Pashinyan, after partnering with the RPA and the Prosperous Armenia Party in a vote that once again forced people to the streets in an encore in October 2018. The ARF has since been criticised for not properly acknowledging its mistakes, assuming it did make some. Even before all of this, the ARF was criticised for favouring the path of making changes from within (even in Coalition with the RPA) instead of on the streets (in Coalition with the people), as well as for transitioning away from its progressive roots while involved in some of these partnerships. The World Congress needs to break down these decisions, and hear the justifications from the incumbent leadership. Assuming it accepts their justifications, the World Congress needs to ask why 96.1% of the public did not accept these same justifications at the December 9 polls? This is where packaging and messaging may need to be scrutinised. Before and after these elections, the ARF brought up some very valid concerns about the elected policy paths of Pashinyan and his team – I too am not comforted by his economic agenda and could be more at ease with his foreign policy standing with less spin-populism and his rhetoric of the potentially chaotic “governance by Republic Square” strategy. However, it is obvious that most people are not listening to the ARF’s concerns. Why not? What can the ARF do better to reverse this worrying trend? It was U.S. President Harry S. Truman who famously had a sign on his desk with the following inscription: “The buck stops here!” – meaning that responsibility is not passed on beyond this point. In the ARF world, the burden to determine where the buck-passing stops and to set frameworks for future corrections rests with the World Congress. An honest self-reflection at this World Congress will ensure the ARF comes out of what is a historically critical meeting with decisions that will lead to a period of the correct policies; better packaged and efficiently delivered. This will ensure the path forward leads the ARF to clawing back some of the political capital it has lost. There is no doubt that the ARF deserves its place at Armenia’s decision-making table. It has protected everything Armenia and Armenian for 128 years. A pinpoint, self-reflecting mirror at this World Congress is the opportunity to ensure the ARF continues its exemplary service for the next 128 years and beyond. As long as the ARF lives in lalaland in the diaspora, nothing will ever change. It’s stuck in the 20th century with hopes and aspirations of a long forgotten struggle. The realities of today’s Armenia is a world away from the dream-like ideology of its past. Well said Haig! I don’t think the ARF has the intellectual capacity to reflect on itself and come up with a strategic plan. The ARF is more concerned about its party than the People of Armenia. I was an ARF supporter for years and I have been involved with many ARF organizations, but I have always been mocked for my intellectual thinking. I am no longer an ARF supporter based on my personal experience and their opposition to the People of Armenia’s request to elect Pashinyan as their leader. I am working directly with AGBU and its NGOs in Armenia and my intellectual thinking is very much honored. Mr. Kayserian’s substantive thoughts are very appropriate. (relevant to today, connecting with the citizens ) policies and packaging…” are created. The theme of “exemplary service of the past” has to once and for all be a secondary frame of reference replaced by a “today” theme. A simple change of Bureau–as some demand– is not an answer; as Mr. Kayserian notes, this is an organizational issue. The long “clawback’ will start only if the organization re-defines itself to understand and create policies that connect with the citizens of ROA. This a large order for an organization that has had 128 years of the same drill and not a single bit of adaptation since independence in 1991. Being 128 years old is no basis for being at the decision making table. There is no entitlement here. Organizational history shows ARF is only capable of referring to its history rather than creating and promoting meaningful and contemporary thought process. Thank you, Mr.KAYSERIAN. Your article on ARF Armenia is one of the most truthful and candid writing posted in Armenia Weekly. It is not only candid; it also depicts the shortfalls of the organization. There is no doubt in my mind that ARF has worked relentlessly to keep the Armenian spirit, both in the fatherland and the diaspora. However, the social and political capital that was built in the last 128 years has come to an end due to the misguided policies of its leaders. These honchos in the ARF/Armenia, have squandered many viable opportunities and have failed to understand and attend to the needs of the people. In fact, their arrogance and inconsideration towards the people were often driven by political and personal financial interests. The most serious failures of these egotistical leaders have been their perpetual collaboration with the last two corrupt presidents. While the country was desperately seeking government reform, the likes of Aghvan Vardanyan, Armen Rustamyan, and Hrant Markarian were actively denying the need for reform. Until the end, they miscalculated the power of the people and acted against their wishes. That is exactly why they lost their seats in the National Assembly/Parliament. Everything said the upcoming ARF meeting has to focus on purging the old leadership and replacing them with pragmatic, more younger individuals who can listen and pay attention to the needs of the people. Very balanced and to the point article.